Hoboken parking signs read 4-hour grace period -- how about a 20-minute disgrace? I was ticketed $218 and booted for parking on Third and Grand just for picking up a report at Hoboken University Medical Center. What favor is Director Sacs doing me? How out of touch is this guy with the community "doing us a favor"? It's a scam and we all know it. I wasn't puzzled, but disgusted. The former head of the Hoboken Parking Utility is facing eight years in prison after appearing in Superior Court on Friday to admit his role in the theft of $600,000 from that city’s parking meters. John P. Corea pleaded guilty before Superior Court Judge Francis R. Hodgson Jr. to official misconduct, a second-degree crime carrying a potential prison term of 10 years. In entering his guilty plea, Corea, 45, a Hoboken resident, admitted steering three no-bid contracts to United Textile Fabricators, an arcade game manufacturer headed by a Toms River man, to collect and count coins from Hoboken’s parking meters. Corea told the judge he made false statements to the Hoboken City Council about the company’s qualifications, and that he came to believe that the head of the company, Brian A. Petaccio, 51, of Toms River, had stolen a substantial amount of the city’s parking revenues. A 22-year-old employee of the Hoboken municipal garage was arrested on Friday in connection with the theft of a police transponder from back in January 2009, according to police reports. On Friday, police concluded that a plastic encoded transponder and a GPS SIM card, both owned by the City of Hoboken, was initially stolen by Terry McDonald, a mechanic at the Hoboken municipal garage, 256 Observer Highway, reports said. Police generated a warrant complaint against Terry McDonald charging him with burglary, theft and theft of services, reports said. TRENTON – Attorney General Anne Milgram announced that John P. Corea, former director of the Hoboken Parking Utility, was indicted today on charges that he conspired to steal more than $600,000 in parking meter revenue that he allegedly split with a Toms River contractor whose company was hired by the City of Hoboken to collect coins from city parking meters. John Corea, former director of the Hoboken Parking Utility, was indicted today on charges that he stole $600,000 from Hoboken. He is shown in January demonstrating parking in the re-opened robotic public parking garage on Garden Street in his own Corvette. The former director of the Hoboken Parking Utility has been indicted on charges he conspired to steal more than $600,000 in parking meter revenue. State Attorney General Anne Milgram announced the indictment against John Corea, 45 of Hoboken, today. What did you expect, Forrest? "Stupid is as stupid does, that's what my mama always said." I just don't know of anything that characterizes John Corea's "relationship" with the City of Hoboken better than that. At this point, he is a "figure in the investigation" of more than a half million dollars that just can't be found. Because, you know, that kind of money is usually left laying about in discarded Shop-Rite bags. All other things being what they are, the best predictor of future behavior is past performance. And Corea's past performance has been less than stellar. It seems that when Corea worked at the NY Stock Exchange, he developed a habit of buying stocks with other people's money and then leaving them holding the bag - and the bill - when the stocks went sour. City Attorney Steven Kleinman confirmed on Thursday that the state police are looking into possibly missing money from the Hoboken Parking Utility's collections from parking meters. The city may file litigation against the coin collection company, United Textile Fabricators, a Toms River-based company that allegedly misplaced as much as $582,352 last October that they counted for the city. The money was returned in installments beginning in November 2007, but without interest. The owner of United Textile Fabricators is Brian Petaccio, former co-owner of Grayhound Electronics, who was indicted to state Grand Jury racketeering charges on March 7, 1991. According to Kleinman, the company has since surrendered the funds to the city, but without interest. He said that the city has stopped using the company and is with holding payments until the matter is settled. "The administration is looking at all aspects of United Textile Fabricators," Kleinman said Thursday. HPU Parking Director John Corea had previously said at the Dec. 6 council meeting that his agency's most recent internal audit only showed $34.61 missing. The Hoboken Parking Utility is under investigation by the New Jersey State Police, say sources with knowledge of the investigation. "It is accurate that the city is currently reviewing issues involving the Hoboken Parking Utility," Hoboken Corporation Counsel Steve Kleinman confirmed yesterday. "There is a law enforcement aspect to this matter, however, (so) I am constrained from commenting further at this time." Kleinman said the investigation is related to United Textile Fabricators, the company that collected the revenue from the city's parking meters from December 2005 until a few months ago. Last October, it was learned that UTF owed Hoboken at least $582,352 in revenues that the company collected but didn't give to the city. UTF paid Hoboken in full by the end of last year. And people wonder why Hoboken has a budget crisis. Aside from property taxes, parking meter collection is one of Hoboken's biggest revenue sources. But for a two-year period between 2005 and 2007, Hoboken was owed almost $600,000 dollars from a South Jersey company it hired to run its parking meter collection. The city is now looking to collect interest on that money. In Dec. 2005, Hoboken hired Toms River-based United Textile Fabricators to collect their parking meter coins and return the money to the City. Almost immediately, Hoboken's parking meter revenue dropped. According to an internal audit from the Hoboken Parking Utility, in Nov. 2005, the city made $115,512.82 from the meters; UTF took over the next month and only handed in only $74,470.00. Audit finds Parking Meter Collections for fiscal year 2007 compared to fiscal year 2006 decreased 33%. United Textile Fabricators had been previously taking the coins to their place of business in Toms River, NJ and depositing the funds in their accounts. The Hoboken FY2007 budget (July 1, 2006 to June 30, 2007) had some interesting comments on the City's parking meter coin collection, coin counting, and meter repair contract. The City contracted with United Textile Fabricators, Toms River, NJ for coin collection services and deposit of the City’s monies for 2006 and on a month-to-month basis for 2007. Collections for fiscal year 2007 were $660,894, compared to $991,316 for fiscal year 2006, representing in a decrease of $330,422, or 33%. Many years ago, former Councilman/Assemblyman Robert Ranieri said at a Council Meeting…. "In the land of the blind, the one-eyed man is King." The Hoboken Finance Department has a responsibility to record every dollar that comes into and leaves the city's coffers. But something went seriously wrong when a Council member asked why anticipated cash revenues from the Hoboken Parking Utility "parking meters" decreased by over ONE MILLION DOLLARS. 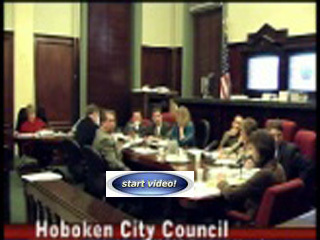 As a point of reference, on November 14, 2005 the Hoboken City Council passed Resolution No. 05-179 approving a $300,000 one year contract with Donohue, Gironda & Doria - a Bayonne firm that specializes in municipal accounting - to privatize the city's Finance Department. The City recently entered into the third one-year contract with the accounting company that has been working alongside the city's chief financial officer to manage the city's books. Councilman Cunningham said "For God sake, clearly, this audit indicates that we have got money going out the back door and something needs to be done about it." Click on the parking meter for the full story. A million bucks, [that's FOUR MILLION quarters weighing almost 50,000 pounds], reported missing from the Hoboken Parking Utility "parking meter" collections revenue? That was the question asked by Hoboken Third Ward Councilman Michael Russo at the City Council's Budget Hearing on December 6, 2006. Two weeks later at the December 19, 2007 City Council Meeting, Parking Utility Director John Correa advised the Council that he initated an internal audit of parking meter revenues in response to Russo's inquiry. The audit showed a difference of Thirty-Four Dollars and Sixty-One cents ($34.61). Sixty-One cents? Damm, those "penny parking meters" can really screw up the accounting system. HOBOKEN - After three months, the patience of customers hoping to return to the Garden Street automated garage by the end this month will be tested a little longer. The company that contracted to get the futuristic garage at 916 Garden St. up and running again is unlikely to meet a March deadline announced by the Hoboken Parking Authority. 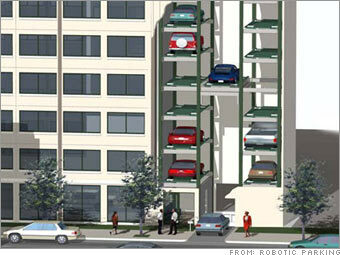 The city of Hoboken, N.J., signs a deal to have Robotic Parking operate its Garden Street Garage, tripling the number of available spaces by shuffling cars in and out through automated lifts. When Robotic hikes its monthly fees by 20 percent, however, Hoboken officials give the company the boot. One small problem: Robotic's employees are the only ones who know how to operate the system, and the company disables its software, trapping dozens of customers' cars in the garage for days. After a court order restores its control of the garage, Hoboken pays $1.9 million to another firm to install a new system. The Hoboken City Council is putting its faith in an Israeli company to run the robotic Garden Street garage, which has been plagued by problems since it was built three years ago. The council voted Wednesday to award Unitronics a $2 million contract to replace and fix mechanical and electrical problems and replace software that controls the 314-space garage at 916 Garden St.
HOBOKEN - The City Council will vote Wednesday whether to award a $1.9 million contract to Unitronics, Inc. to fix problems with the automated garage at 916 Garden St. If approved, the Massachusetts-based firm will be contracted to fix mechanical, electronic and software problems to make the troubled garage run smoothly. HPU: HOW MUCH MORE GARAGE NONSENSE WILL YOU TAKE? With last week's article on 916 Garden, we are no doubt faced with another costly blunder. And it is still not over! How much more can we take. I say none, zero, zilch, nil. This not only affects those that park at 916 Garden, but the city as a whole. With what was touted by the city as...state of the art and first of its kind; will solve our parking problems; to.. .let's dissolve the authority and bring it in house to control (and spend) the money, and lastly, appoint somebody locally to manage parking, we are now faced with virtually no solution but more posturing and more waste. Federal Court Judge Stanley Chesler ruled last week that the city of Hoboken broke a confidentiality agreement with Robotic Parking, the Florida-based firm that designed the software for the automated 314-car garage at 916 Garden St., when it brought in an outside fir m to use Robotic's software. Now the city of Hoboken will be forced to run the automatic garage by itself until it can be retrofitted with new operating system. The problems began earlier this year, when the city of Hoboken continued its longstanding battle with the garage's original designer, Robotic Parking, and terminated Robotic's contract to run the garage. However, as currently configured, the garage cannot operate without Robotic's software. Despite a $ 4 Million surplus in the Hoboken Parking Authority operating budget, the Roberts Administration faction of the Hoboken City Council voted 6-3 in favor of a 20% increase in monthly parking garage rates. Interesting enough, Hoboken Parking Director JOHN COREA while defending the need for the increase stated that the revenue was needed to maintain the garage facilities. When asked about the $4 Million in surplus funds, COREA admitted that the "PROFITS" garnered from parking meters, garage space rentals, parking violation summonses, and booting/towing vehicles are transferred into the Hoboken GENERAL TREASURY. At one time, the purpose of the Hoboken Parking Authority was to create parking within the City. Four years ago, Mayor Roberts dissolved the autonomous Hoboken Parking Authority and created the city controlled Hoboken Parking Utility. It is now apparent that the sole purpose of the Hoboken Parking Utility is to operate as a public “for profit” business enterprise with the “surplus funds” used to fund Hoboken City government. The resolution to increase monthly garage parking rates was sponsored by Councilwoman-at-Large Terry LaBruno and approved by Fourth Ward Council Christopher Campos, Fifth Ward Councilman Michael T. Cricco, Sixth Ward Councilman Nino Giacchi, Councilman-at-Large Ruben Ramos Jr., and Councilman-at-Large Peter Cammarano. First Ward Councilwoman Theresa Castallano, Second Ward Councilman Richard Del Boccio and Third Ward Councilman Michael Russo voted against the increase. Hoboken: Just when you thought it was safe to park your car in the 916 Garden Street Automated Garage, the facility experienced major operating problems over this past weekend. HOBOKEN - City officials and the former operators of the Garden Street automated garage reached a settlement Wednesday that will keep the 314-space garage in business. According to a joint statement released yesterday, the city will pay Robotics Parking Inc., of Clearwater, Fla., $5,500 a month for three years to license the software needed to operate the intricate system of elevators, pallets and pulleys. HOBOKEN - City officials plan to ask a federal judge on Monday to order an injunction against the former operators of the Garden Street automated garage, claiming the Florida-based company hijacked the system and trapped several hundred cars in the facility at rush hour yesterday morning. The computer system that operates the first-in-the-nation garage came to a grinding halt early yesterday morning. As of last evening, the 314-space garage was back at work, but only on a sporadic basis, officials said. To date, the Hoboken City Council has authorized via Resolution the payment of over ONE MILLION dollars to Robotic Parking, Inc. for management of the 916 Garden Street Automated parking Garage. Here is a comprehensive listing of the City Council Resolutions authorizing the agreements and payment. HOBOKEN - The battle between the Hoboken Parking Utility and the operators of the Garden Street automated garage broke into full-fledged war Tuesday night - and city taxpayers could be left picking up a multi-million tab. Escorted by several Hoboken police officers, Parking Utility director John Corea entered the city-owned garage at 916 Garden St. just after 10 o'clock Tuesday night, and ordered an employee to leave the premises, according to Dennis Clarke, general manager of Robotics Parking Inc., the Clearwater, Fla.-based company that has operated the first-in-the-nation garage since it opened in 2002. HOBOKEN - Those who use the Garden Street automated garage could be out on the street if the city cannot negotiate a new contract in the next few days with the owners of the beleaguered first-in-the-nation robot garage. On July 19, Robotics Parking, Inc., the operators of 916 Garden St., distributed warning letters to the 314 tenants, notifying them their cars must be removed from the facility by Aug. 1. "Ahh forgot one point on the Jeep: investigations into the software recordings revealed that the operator on shift overwrote the software, kicked it out of automatic mode into manual and moved the car into the system, than switched the system back into automatic mode again. Just that the car was NOT inside the confines of the pallet. Operator on shift: the one operator of the HPU." -- Gerhard Haag, President of Robotic Parking, Inc. The battle between the Hoboken Parking Utility and the operators of the Garden Street automated garage broke out into full-fledged war last night — and city taxpayers could be left picking up a multi-million dollar tab. Escorted by several Hoboken police officers, Parking Utility Director John Corea entered the garage, at 916 Garden St., just after 10 p.m. and ordered an employee to leave the premises, according Dennis Clarke, general manager of Robotics Parking Inc., the Clearwater, Fla-based company that has operated the first-in-the-nation robot garage since it opened in 2002. Like a bad marriage where the bickering parents stay together too long for the sake of the kids, the often uncomfortable union between the Hoboken Parking Utility and Robotic Parking Solutions is on the verge of dissolving. At stake is the future of an innovative yet troubled automated 314-car automated garage at 916 Garden St., which may have to temporarily close unless a resolution is reached before Aug. 1. Suspended parking officers cry harassment. Employees make allegations against the city. After receiving suspensions for ticketing police officers, two of Hoboken's Parking Enforcement officers claim they are being harassed by police and mistreated by the city. Breaking point in garage fight? HOBOKEN — Those who use the Garden Street automated garage could be out on the street if the city cannot negotiate a new contract in the next 11 days with the owners of the beleaguered first-in-the-nation robot garage. Did they ticket the wrong people? Two Hoboken parking employees who were suspended last month for allegedly issuing tickets in a "retaliatory manner" say they are the ones being retaliated against for trying to write tickets for police officers and other connected individuals who were illegally parked. MORE TROUBLES AT 916 – This Jeep was the second vehicle to fall off a pallet since the garage opened in Oct. 2002. No one was hurt in the accident. A Hoboken resident's Jeep was totaled at around 2 a.m. Sunday after it fell about four stories inside the automated Parking Garage at 916 Garden St. There's good news and bad news regarding the Hoboken Parking Utility, the city agency that deals with parking permits, garages, and enforcement. The fact that the city issued 82,191 tickets for violations last year might be bad news for the 82,191 people who parked at expired meters or without a permit. The good news is that the HPU's own report, issued last week, shows more parking enforcement and more people using the city-run garages. COREAN CONFLICT - Hoboken Parking Utility Monitor John Corea said in a lawsuit that he was damaged by comments on an Internet message board and in a letter. With the growing popularity of Internet message boards, this new venue has become one of the favored outlets for anonymous mudslinging - especially in politically heated Hudson County. INQUEST – Mayor David Roberts has formed a task force uncover the current status of the 324-car automated garage. Frustrated with the lack of progress at the 324-car garage at 916 Garden St., Mayor David Roberts announced that he will be launching a independent investigation into the garage. According to city officials, Police Chief Carmen LaBruno and Professor Constantin Chassapis, director of the Department of Mechanical Engineering at Stevens Institute of Technology, will lead the fact-finding mission on the 916 garage. The investigation will begin immediately, and the mayor expects an initial report of findings and recommendations to be completed within the next two weeks.